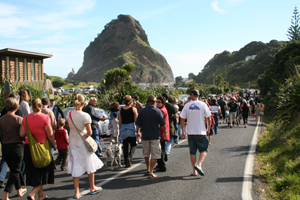 Piha R&R believes that opening the stream mouth to allow the tide into the Piha Lagoon serves two critical functions. 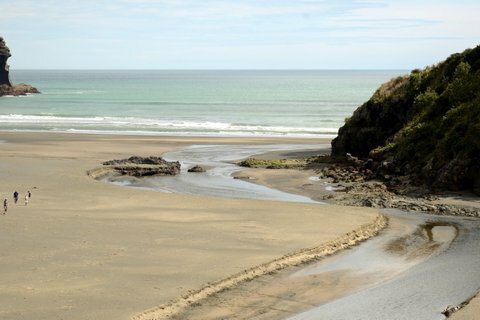 First, the flushing of the Piha Lagoon by the tide reduces the Ecoli levels(pollution) below the minimum levels for safe swimming. This has been confirmed by testing following natural flushing after nature has flushed the lagoon as a result of king high tides and heavy rain. Keeping the sand bar at the stream mouth low enough to allow periodic flushing by the tide, by mechanical means when required, reduces the immediate risk of flooding further upstream in a rain event and allows th any flooding of the Glen Esk Valley to dissipate more rapidly should flooding occur. We have been discussing this approach with Auckland Council for several years without a lot of success. However, following the flooding incidents of 2018, we have gained some greater enthusiasm from Council. Minutes of our most recent meeting can be seen HERE. or below. R&RA presented their understanding of both issues and a proposal for dredging of the sand bar to allow tidal flushing of the lagoon. Essentially a small scale cut to fill operation each Nov before summer bathing season and intermittently when the sand bar gets high. They believe 3 times per summer would suffice to keep the water level down to 1mRL. They have received quotes of $7,000 for each summer. They have taken samples using their own testing kit and see a far lower count of ecoli following high tide flushing. They also believe stirring of sediments within the lagoon affects ecoli counts. They would like to see the permanent no swim signs removed and believe lowering the sand bar would achieve more safe swim days. They accept there will still be issues on rainy days from OSWW system spills. JR and RS presented findings on the flood risk effect of the sand bar:- No effect on flood risk above Sea View Road bridge, around 0.5m lower stream water level next to the bowling club could be achieved during significant storm events however this included dredging of the river as well as the sand bar. The effect of removing only the sand bar has not been considered from a flood risk perspective. Next to the bowling club, the stream could be reduced from 2.5 to 2mRL but land flooding is at 3.5mRL and overflows from near the art gallery and Fire house area. RS tabled some surveyed levels of the lagoon and sand bar (dated July 2018) and a photo taken 17th June 2018. Water levels look to be around 1.5mRL when tide is low. Topo survey showed the sand bar at 1.6-1.7m at its lowest point. The lower lagoon levels resulted from the large storm event in Feb 2018. Average tide is 1.9mRL therefore some tidal flushing of the lagoon would be expected following the Feb storm. The period of time before the sand bar reforms at the mouth of the stream is unclear and support from the community would assist the understanding of this process. Council took samples in March/April and again in October 2018. Whilst there are safe ecoli levels on some dry days others are high, wet weather levels are generally very high. Full test results will be forwarded. The test results suggests there was a limited benefit of the lower sand bar level during this time. The T&T report recommended lowering to 1mRL to get tidal flushing benefits. The group agreed that it would be beneficial to understand the relationship between and sand bar height, ecoli counts, and tide levels to determine if the permanent warning could be changed to a reactive warning. Regular photos by locals could assist. It was agreed that there will always be intermittent warnings unless upstream OSWWM systems are well maintained and sufficient for use. This is a long term goal which has a separate council programme. It has been previously noted that excavation of the sand bar would likely involve notified consenting and robust health and safety set up, which could cost significant amounts additional to the physical works. There could be opposition from other groups such as those seeking protection of the sand dunes. The T&T report asked the question of sediment flow from the lagoon to the sea if the sand bar was to be lowered. Richard to get the sand bar area surveyed in more detail and provide levels to R&RA. It is noted that levels can vary quickly but this provides a starting point to understand the scale of works. R&RA to draw up in detail the location and amount of sand their proposal would involve moving. Based on the R&RA detail, RS to get a preliminary assessment from a planner to check on likely consenting requirements. RS to forward the test site maps and results to Graeme and Ken.